I got the tast back. Let's start with another update of Jingles. I'm trying do get up with the rest. As it is now October, so I wanne try and finish 10 parts, and most of the border. ........and as this is such a little piece it finished very quickly. So I started the one next to it, and ALMOST finished, as I haven't run out of white thread . But only a few pieces left. As you see I made it hard for my self, I made the pieces criss cross, did a bit of the border each time so I could do the next part. I'm now working on Deck the Halls and that the one totally above left, all the colors except white. My sweet friends Petra send me a bit of her color as she isn't using it. If the mailmen is sweet to me, I will get it tomorrow and will try and finish the both pieces and then I'm done for the month. I only have left the 2 big pieces in the middle and the whole border. Both kids with ther new winter hats. I changed the one for Kira a bit, so need to make a new pic. Noah is so proud of it, yesterday morning he wanted it on his head to school, and everybosy who said something about it he said back. They are very small, and not for eating, more for decoration. So what are we doing with them? We are making wreaths of them..
We are not finished, as it is a lot of work. But the kids love it.. So more about the apple wreath later. 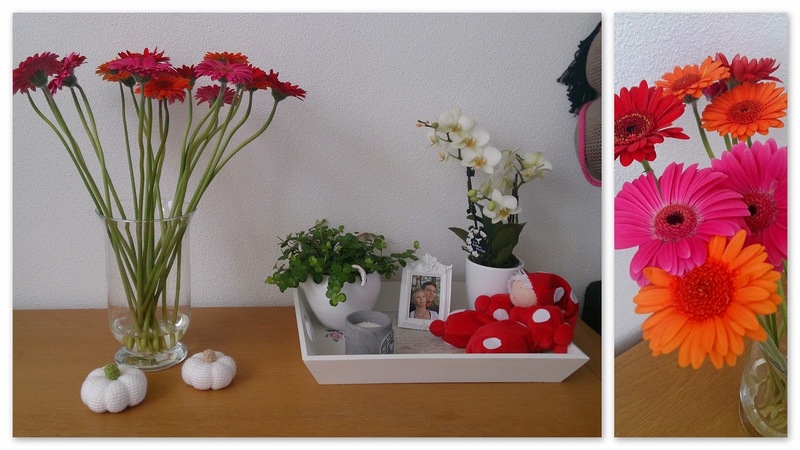 Let's end this post with my beautifull flowers. Zo leuk die foto met de muts van je dochter! Je winter borduurwerk is leuk. En mooie bloemen. 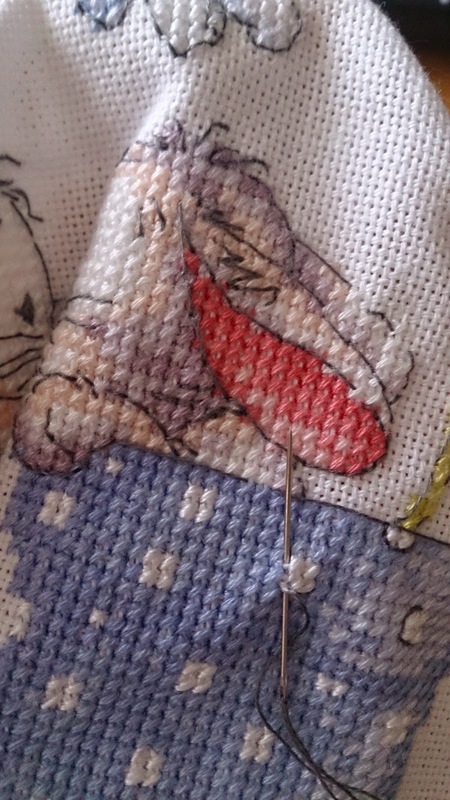 Stitching is looking good. Nice warm hats for the kids. I never noticed til now how much those two look alike! Great stitching! Your models are adorable!!! Nice to see you crafting together with kids. I love Gerbera flowers too but I was never successful in growing them at home. They are very slow progressing plants. Do you have them in your garden? Oh, gaan somebunny en jingles afkomen...spannend! And good for you for doing so much stitching--you are on a roll, indeed!! 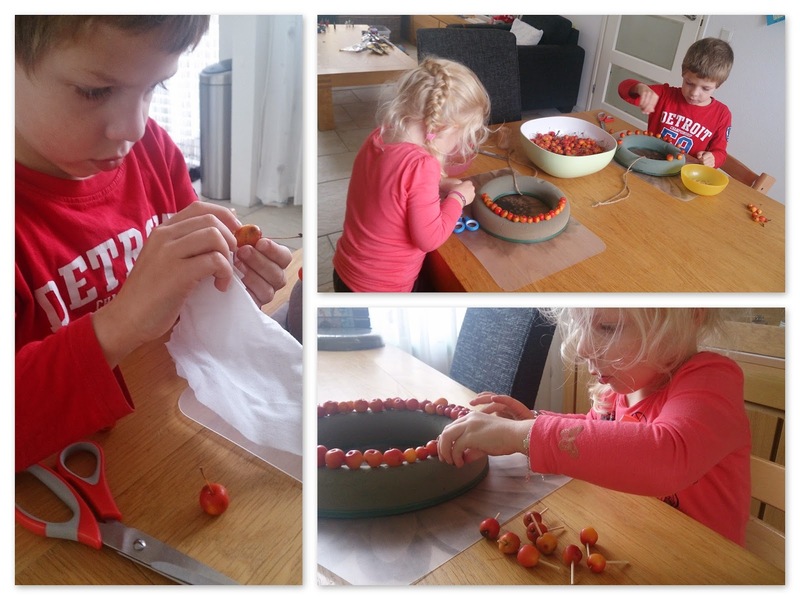 Will look forward to seeing those pretty apple wreaths :) Have a fun weekend with the kids! More about the wreath and the hats on this post but i started reading the newest posts.. I Should have started by reading from here!